This is not writing, by Julian Dashper, (Clouds & Michael Lett, 2011), $39.95. In September 2010, the first anniversary of the death of New Zealand artist Julian Daspher was marked in New York by exhibition of a single artwork by him. Entitled ‘Future Call’, a telephone was installed in MINUS SPACE, a Brooklyn art gallery, and then periodically phoned from New Zealand, nominally ‘ahead’, time-wise, from much of the world — but the call was left ringing and unanswered. ‘Future Call’ was usually undertaken by the artist himself, but in the Brooklyn show the call was now placed by the artist’s wife, Marie Shannon. And this was Dashper’s great skill: he made artworks that often had an existence apart from their embodiment. They were frequently works that could be carried anywhere, a nomad’s art gallery, curated in the mind, and changing with circumstance. This is not writing is a near-definitive collection of Dashper’s public writings, compiled from gallery catalogues, interviews, magazine articles, and the artist’s archives, and selected by the artist himself prior to his death. Not only are these texts descriptive and revelatory of intent and circumstance, they are often works of art in themselves, performative utterances by an artist whose material range frequently seemed subsidiary to a state of being. With Dashper’s death, these texts take on new resonances, just like Curriculum Vitae (various dates), the title of a piece consisting of Dashper’s written biography and list of exhibitions that was simply pinned to a gallery wall, taking more space each time. Now, while the exhibitions are still added to the exhibition-listing, the biography pages of Curriculum Vitae are considered to have been completed. This is not writing is a book published by Clouds and Michael Lett in June 2011. Hefted in the hand, it weighs in at 670 gm, feeling pleasant to lift and to hold, one of those exact weights of both delight and use. It is not problematic to read in bed or on a desk, though the binding is of such quality that the book itself prefers closure — perhaps oddly, in view of its content. The volume measures 166 x 236 x 23 mm, and is thus not pocketable, though easy carried, and possibly with some social cachet (eye-catching design and colour) in the carrying. Hardcover and cloth-bound, This is not writing is a pleasing light pink (JHT #0008), more old-fashioned prosthetic than primrose. The cloth has a slight nap that furs under the fingers nicely. It was bound, as it was printed, by Everbest, in China. The cover is titled on the upper left front, in black 18-point font, discreetly. The spine contains the title and the names of author and publishers in 10 point, even more discreetly. The font is Helvetica Neue (Linotype), which is used throughout the volume. The paper is 140 gsm SUN woodfree, with no sense of flimsiness, but rather an appropriate gravitas. It does not take fingermarks. 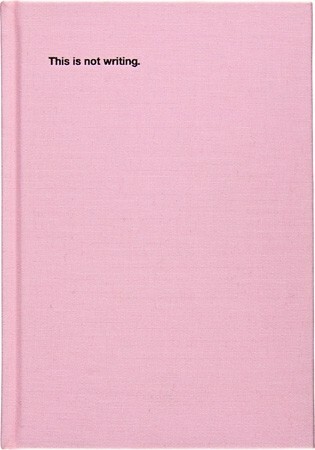 Importantly, the acknowledgements page of This is not writing contains an editor’s note by Gwyneth Porter, the writer, curator, and former editor of the NZ periodical Log Illustrated, which states that the book was based on a list and materials provided by Dashper to gallerist Michael Lett in 2008. The tone and formal qualities of Dashper’s writings (particularly his use of the dash and ellipsis) have been retained by the editor, as was Dashper’s titling (unitalicised, initial uppercase only). The versions of the texts are those chosen by Dashper. At 188 pages it is an ideal length for a book that aims for a ‘complete’ status. It is without any size-of-a-doorstop portentousness. It is approachable and companionable. This is not writing has been produced in an edition of 1000, giving the book some of the quality of an artist’s limited edition for the purchaser. The book was designed by Luke Wood, of Christchurch, co-editor of online-design journal The National Grid. Wood’s work ‘seeks to centralize the role of the physical artefact — the publication — in the development of an engaged network of participants in such a project.’ It’s readily apparent that in This is not writing Wood has succeeded in this aim. The unique International Standard Book Number identifier of This is not writing is ISBN 978-0-9582981-9-3. Each copy is individually shrink-wrapped. A member of the public had apparently assumed the display unit was simply malfunctioning. It wasn’t the first time that Dashper’s brand of reductive art — ‘They thought there was nothing there’ — had been subject to change by viewers or exhibitors. As Dashper relates, even his own technicians on occasion could not find or see the art-work they were being called upon to witness. An expert at maximalisation; a constructor of enigmas; an adaptor of conceptualism, of abstract expressionism, and of minimalism to his own ends; a former Fulbright Fellow and holder of a Marfa Artist’s Residency; and also famous as an exhibitor of drum kits in art galleries: it is possible to claim that Julian Dashper was one of great showmen of recent New Zealand art practice. But Dashper’s work was never appearance without content, and it was never without contention. The texts collected in This is not writing, written or produced between 1986 and 2008, record Dashper’s development and form a bracketing of — a commentary on — modes and means of creating art in a contemporary context. Dashper’s texts also straddle the line between artwork and documentation — enough in his case as to put the distinction profoundly in question. And in an age of brevity, blogs, Youtube clips, inevitable links, and cut-and-paste, the relevance of Dashper’s own complexly reductive works (often with a self-enclosed commentary) is immediately apparent. Emblematic of this contemporaneousness is Dashper’s intensive utilisation of lists as an art-form, as for instance in: ‘Sydney 2000’, ‘Favourite Things’, and ‘100 thoughts as an artist in residence at the Chinati Foundation, Marfa, Texas’. Dashper’s texts also forefront the role of an artist in contemporary culture, not only with regard to Dashper’s own practice, but also in terms of of an entire contemporary art movement. He proves himself to be a sharp observer of the strategies and styles of both himself and his peers. ‘Things I remember Philip Clairmont saying today’ (a typical Dashperian title) offers cumulatively revealing glimpses of that artist: ‘Don’t let the landlord see past the front door’; ‘I’m an inside person’; ‘If you turn it up past here, the neighbours ring up’; ‘Try painting outside, if your studio is too small. Outside is big’. Curiously, the weakest texts in This is not writing are the interviews — perhaps the archetypal twentieth-century literary style — where Dashper explains, contextualises, and situates his work for the benefit of various interlocutors. These interviews might have historic and personal interest for students, art historians, and those interested in contemporary art — and they are nothing if not engaging — but when they are flatly juxtaposed with the elan and intensely wrought succinctness of Dashper’s practice as documented by the volume’s more performative texts, they suffer by the comparison. 1. See particularly the Simone Horrocks and Richard Flynn film Julian Dashper My Space, a document/documentary supported by The Screen Innovation Production Fund, filmed in 2008 and released in 2010, as per the artist’s wishes, on Youtube. It is also fascinating to discover in Dashper’s video and on-line documentation that he speaks as much as he writes. The real history of wit remains to be written, but Dashper can be seen, in some ways, to be the heir of both John Donne and Oscar Wilde. Donne’s use of an extended metaphor, where two very different ideas are combined in a single conceit, and Wilde’s epigrams are perhaps the true precursors to much of Dashper’s written art. Dashper’s works and his writings are invariably tight, taut, condensed — and audacious. More often than not they open up a field, rather than close it down. They contain worlds. But while the texts of This is not writing dissolve distinctions — between high and low, work and commentary, object and practice — many of Dashper’s works, such as ‘Untitled (Portrait of Ben Curnow)’/‘The work consists of Ben Curnow sitting at a desk in the gallery’, contain a profound finality at their core.1 In each exhibition of the work, Curnow ages and changes. In each exhibition, he inhabits a different environment. It is a portrait in practice. It is abbreviated, sure, changing and terribly finite. Like the portrait of Curnow, the texts of This is not writing almost inevitably encourage metaphysical flights of thought. They are surprisingly brief. The best of them are a sentence long. They are conceits, intent on capturing fragility and transience — the profound and frequently joyous ephemerality of our deadly passage through time. Julian Dashper died in April 2009, at the age of 49. The creation of ‘Untitled (I’m afraid of red, yellow and blue)’ Acrylic paint on wall, 2009, dimensions variable. DAVID HERKT is an Auckland-based television producer, writer and poet.